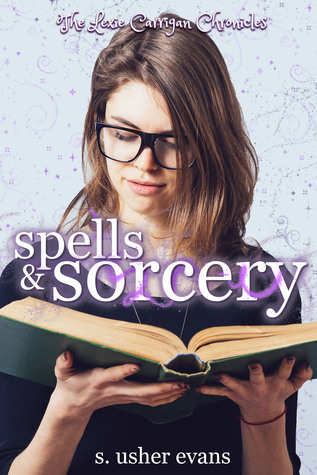 Spells and Sorcery is the first YA fantasy from S. Usher Evans, author of the Razia series, the Madion War Trilogy, and Empath. Which meant…well, I supposed I could summon sunglasses. I could do probably anything I wanted to. I had no idea what the limits of my newfound powers were—or anything about them, really. But if I could summon sunglasses, I began to wonder what else I could conjure with the snap of my fingers. My turkey sandwich on white bread was suddenly unappetizing. Glancing around to make sure no one was watching me, I considered what I really wanted to eat for my birthday lunch. I envisioned a thick, juicy steak and a baked potato with sour cream and butter and flicked my wrists like I’d seen Jeanie do. “Well, damn,” I said, sitting back. Okay, so apparently there were limits to what I could do, and conjuring a steak was one of them. Huffing to myself, I reached for the sandwich again. Two bites in, I remembered my magical spell book. If I could summon my sunglasses, maybe I could summon the book, too. “Uh…bring the book!” I said, flinging my wrists out. This time, it appeared in that same cloud of purple magic. I heard laughing, and my heart stopped in my chest. Had anyone just seen what I’d done? After a few moments, I spotted the source of the laughter. A group of juniors was hanging around one of the tables. They noticed me staring at them and I quickly looked away. I didn’t think they’d seen anything, but I wasn’t eager to attract their attention. But now I had the book, and at least a few minutes to read it. I quickly flipped to the first chapter to pick up on where I’d left off the night before. Spells are distinguished by their outcome and the object with which the magic has been applied. A SUMMONING SPELL, then, will present object to the summoner without use of the physical movement; A CHARMING SPELL will animate an object as if it were alive; An ATTACK SPELL will cause physical harm to another magical user; Et cetera. A Magical’s best tool for spell work is a well-crafted mind. Magic is but an extension of the Human Will, and it is as powerful as the mind it inhibits. While there are certain birth-given limits to the Mind of a Magical, a good Master will improve upon these limits as a sword on whetstone. Daily reading of Latin and classical works, Magical History and Theory, as well as daily practice in arithmetic will sharpen the Mind for more effective spellmaking. I love the excerpt and the idea behind this book. This is one of my most wished for super powers. I don’t really listen to audiobooks, but I think I agree with you that this would make a good audiobook! I like how the cover is so unassuming but the book is about magic! And I like the synopsis too so will definitely check it out!